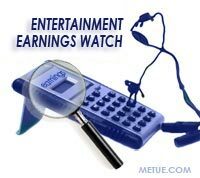 Earnings season is always a busy time in the corporate finance world but for those watching the media and entertainment sectors, Tuesday was a day of particular information overload. DreamWorks Animation, Electronic Arts, Sony and Viacom all reported quarterly results. The news was mixed. There were some bright spots and some unpleasant surprises too. One by one we’ve got the four consolidated into one place; a single stop to summarize all four quarterly performances. A year ago, DreamWorks was riding the wave of “Shrek the Third” when they announced the quarter. This year’s results were far less impressive but year over year comparisons are often misleading in the film industry. From one year to the next there can be vast variation in the production pipeline and expenses. Moreover, DVD carryover from prior hits can be cyclical and the company doesn’t’ recognize much of a film’s revenue until after the distribution partner recovers upfront marketing and distribution costs. This year there was no blockbuster to milk, and no huge recent hit to draw DVD results from. As a result, Q2 net income was off 55% percent compared to last year. But bearing in mind the inefficacy of annual comparisons, the result was actually good. DreamWorks Animation earned $27.5m or 30 cents a share this quarter. Revenue was $140.8m, $46.4 of which came from recent release, Kung Fu Panda. Analysts had been expecting earnings of 23cents a share on revenue of $121.8m (Thomson). The Q2 result easily exceeded those expectations. In tandem with the earnings announcement, DreamWorks Animation announced they will repurchase up to $150m of their outstanding common stock. The game publisher has been pushing ahead with John Riccitiello’s restructuring throughout this past year. They’ve made acquisitions, are pursuing others (See the Take Two Deal Diary Here) and pushing into new realms with more casual game efforts and new original titles. Overall, revenues seem to be showing the effect of all that but costs are still eating up the profit pie. On Tuesday, EA’s results showed exactly that with earnings that fell short of expectations. The company lost $95m or 30cents a share on revenues of $804m. Last year, EA lost $132m or 42 cents a share on revenues of $395m. On an adjusted basis the first-quarter net loss was $135 million, or 42 cents a share, versus $69 million, or 22 cents a share, a year ago. Analysts were expecting losses of just 33 to 35 cents (depending on which poll). The news wasn’t all bad. Not only was revenue up, non GAAP revenue for the year is expected to be up 24 to 32% on the year. Guidance was generally in line with expectations. EA expects a profit of 21 cents to 48 cents per share for the fiscal year ending in March 2009. Adjusted earnings are expected to range between $1.30 and $1.70 per share on adjusted revenue of $5b to $5.3b. Analysts, on average, are predicting a profit of $1.59 a share on revenue of $5.2b (Thomson). •Mobile revenue was up 33% year over year to $44m in Q2. The category now accounts for 5.5% of total revenue and is growing. More iPhone titles (there are 3 now) and Asian expansion should help that trend continue. •Anticipated title, Spore, will launch on September 7. The 20th edition of Madden NFL will launch August 12. Lacking a film hit like last year’s Spiderman hurt Sony’s film division. Troubles in the phone (Sony Ericson) and Electronics division dragged down results even further. Combined, on the quarter, reported Sony profits were nearly half the year ago result. The company reported earnings of approximately $330m for April to June 30th. The was equal to a 47% annual shrinkage. By division, Sony Pictures lost $77m. It was the studios first lost in almost two years (7 quarters). In music, Sony’s share of Sony BMG cost the company $42m in red ink for the quarter. Talk persists that Sony may be looking to buy out BMG’s stake because they believe the music business will help fuel growth in other areas (gaming and electronics, in particular) but so far that chatter remains rumor. The electronics division saw revenues grow by a paltry .7% to approximately $13b (1.4 trillion Yen). Currency fluctuation and the weakness of the dollar were attributed as a significant cause. Overall, Bravia tv’s are selling well. The gaming division, which in the recent past was an anchor holding back the company’s earnings, proved this quarters brightest spot. Revenue was up 17% to $2.1b. Operating income was in the black at $50m versus last year’s loss of $270m. By product line, the PSP saw a 75% rise on the quarter’s sales tally with 3.72m units shipped. The PS3 console sold 1.56m, a 123% year over year improvement. The PS3 result was also more than 200units higher than the competing Microsoft Xbox 360 console. Viacom rounded out the day and largely balanced the news with a better than expected quarter. Despite weakness in the advertising market, the company rode the back of box office hits Iron Man (as distributor) and Indiana Jones to earnings of $407m or 65 cents a share on revenue of $3.86b. Adjusted the company earned 64 cents a share. Analyst estimates were for 58 cents (Thomson). For the same period last year the company reported revenues of $434m and earnings of 63 cents. (Fewer outstanding shares this quarter helped boost the per share income). By division: Revenue for the filmed entertainment segment (Paramount etc) was up 35% to $1.77b. The company’s Networks division which includes MTV, Comedy Central and other TV outlets posted a 4% profit increase. Revenue was up 11% to $2.13b. •The Rock Band video game has shipped 4.8m units and led to 18million paid song downloads. •For the first six months of the year, Viacom earned $677m or $1.07 a share. Last year, for the same period the company earned $637m or 92 cents a share.